The VT56 is the all-in-one comprehensive TPMS tool with coverage for American, European and Asian vehicles. Its advanced features and functions provides complete TPMS management. Thanks to frequent updates, it includes all-new TPMS sensors and vehicles, immediately when introduced each year. Fast and Intelligent: The fastest TPMS tool; designed to continuously adapt to a technician’s needs. 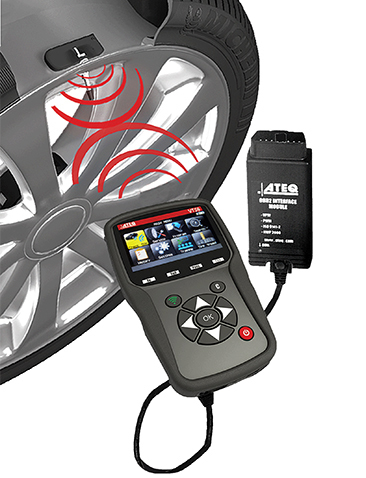 Saves Time and Money: The only TPMS tool with a VIN barcode scanner for fast vehicle selection (North America only). Integrated Help: Tool training, TPMS reset procedures, sensor part numbers, OBD2 locations – all at your fingertips. The VT56 icons visually guide the user through all the functions of this powerful TPMS tool. The icons make using the tool easy to complete the required procedure. Integrated help at your fingertips including tech tips and training on-board. OE and aftermarket sensor part number availability. Program aftermarket sensors, a set of five wheels at a time, ideal for winter wheels. Select by sensor manufacturer or by car model and year. Use the tool to scan the vehicle identification or select manually. Display OBD2 location and built-in relearn procedures for all vehicles.